Survivor: Africa (2001) - 11th place, 6th out. 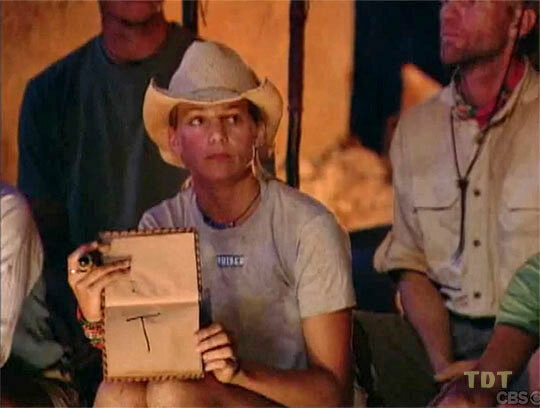 Voted out in Episode 6, "I'd Never Do It To You" (Day 18). Africa Ep. 1 RC/IC: "Trail Blazer" - Helps push the cart, as does the rest of Samburu. With a surge at the end, Samburu wins. Africa Ep. 2 RC: "Stairway to the Stars" - Carries the poles as Samburu wins again. Africa Ep. 2 IC: "Safari Supper" - Drinks her first-round shot at the Damu Bar, then Linda wins the tie-breaker. Samburu wins! Africa Ep. 3 RC: "Rock 'n Roll" - Helps roll the boulder, but Samburu rolls off course repeatedly, loses. Africa Ep. 3 IC: "Distress Signal" - Drives herself to the brink of dehrydration, Samburu loses. Africa Ep. 4 RC: "Caught in the Web" - Matched up against Lex and KimJ, laps Kim, and Samburu wins. Africa Ep. 4 IC: "Movin' on Up" - House carrier for Samburu, which, thanks to its less-hefty workers, loses. Africa Ep. 5 RC: "Get Your Goat" - Now with New Samburu, which loses. Africa Ep. 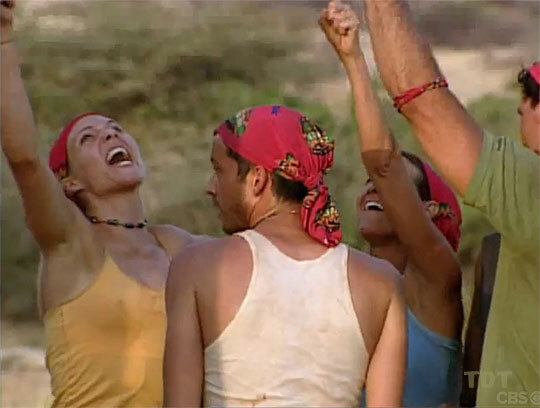 5 IC: "Puzzle of Shields" - New Samburu "wins" as Ethan & Mama Kim throw the IC to boot Silas. Africa Ep. 6 RC: "Africa 102" - Samburu wins a feast! Africa Ep. 6 IC: "Spear-It Hunt" - Samburu loses at flaming arrows. Africa, Ep. 3: Carl Bilancione (voted out, 4-4; lost trivia tiebreaker... to Lindsey). Africa, Ep. 4: Linda Spencer (voted out, 4-3). Africa, Ep. 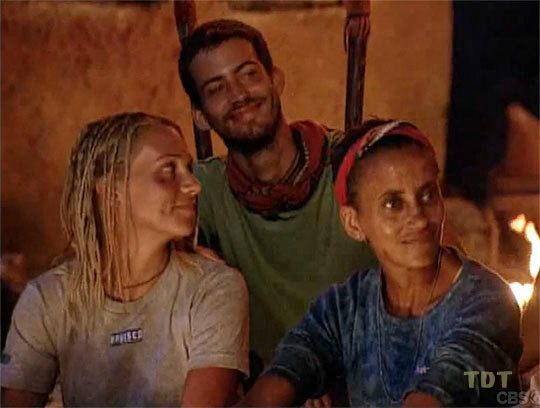 3: Four votes, from Teresa, Frank, Linda, and Carl. Africa, Ep. 6: Three votes, from Lex, Tom, and Kelly (voted out 3-3; out due to prior votes). Freshly dumped off the truck. Have a nice day! Samburu tries to get back on course. Again. Loses. Good news, sleepyheads. It's a challenge! Is that sarcasm? Old people are hard to read. CBSNews.com (11/16/01): "Lindsey's Luck Runs Out"
Jessica Shaw at EW.com (11/22/01): "Lindsey tells EW.com about becoming a psycho"
SurvivorOz podcast interview (4/10/12): "Lindsey Voreis interview"
"Lindsey Richter was born and raised in Portland, Oregon and graduated from the University of Arizona with a Bachelor of Arts degree in journalism. While attending U of A she wrote for their student newspaper, The Arizona Daily Wildcat, and the Tombstone Epitaph, a paper based out of Tombstone, Arizona. During her senior year at college, she spent a semester studying abroad in Queensland, Australia, where she attended Bond University, a private school located near Surfer's Paradise on Australia's Gold Coast. Prior to her departure for Africa, Richter worked as an account executive with an advertising firm in Portland. Before that, she spent a year in Australia working for the Gold Coast Cougars, an Australian professional baseball team. Richter's duties were wide-ranging and included everything from advertising, promotions, sales and public relations to game day activities. Lindsey Richter enjoys spending her free time riding horses, boxing and snowboarding, and is an avid mountain biker who regularly competes on the racing circuit. She describes herself as competitive, spirited and compassionate. Her birth date is August 31."